Sharon, MA, Public Safety Building, April 25th, 2019. 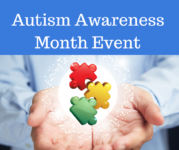 The Sharon Police and Fire Departments Autism Awareness Open House will celebrate Autism Awareness Month. It is designed to help the Sharon community members who care for those with Autism and other special needs. For all ages. For more information or to register, visit www.facebook.com/SharonMAPoliceDepartment/ or contact Sergeant Adam S. Leavitt, Sharon Police Department, adam leavitt <aleavitt@townofsharon.org.